To evaluate the effect of a specified treatment course with CES on anxiety in outpatient psychiatric patients when compared to sham treatment under the same experimental conditions in subjects meeting the inclusion and exclusion criteria. This was an IRB approved randomized, sham controlled, double-blind study in which subjects received either active CES or sham cranial electrotherapy stimulation for one 20 minute treatment during their regular group therapy session. There was also a usual care control group. The subjects, investigators, statistician and staff were all masked as to the identity of the device. The primary effectiveness endpoint was the change from baseline to the post-treatment measurement scores for anxiety of the active group compared to the sham treatment group and control group at the completion of the treatment period. The secondary effectiveness endpoints were the change from baseline in the post-treatment scores for the physiological parameters of muscle tension and vasodilation as measured by electromyogram (EMG) and finger temperature (FT) for all 3 groups. • Male and female subjects with anxiety attending group therapy session dealing with anxiety issues. • Diagnosis of anxiety was verified by a psychiatrist and confirmed using the State Anxiety Inventory (SAI). • Presence of implanted pacemakers, pumps or stimulators. The subjects were randomized based on which seats they took in the group therapy room. Prior to the individuals entering the room each seat had been assigned a treatment. This method of randomization was selected so subjects had the freedom to choose where they sat for group therapy, as usual. Using a “blinding box” the investigators and subjects were unaware as to which subject was receiving active or sham treatment. There were 3 experimental populations: 1) group A: individuals receiving active CES treatment; 2) group B: individuals receiving sham CES; and 3) group C: individuals receiving usual care only (control). The control subjects were known because they were not wearing ear clip electrodes hooked up to a device. Over a period of 10 days, all the clinic therapy groups that worked with anxiety were tested. All subjects were tested using the dependent variables of the State Trait Anxiety Inventory (STAI), EMG, and FT, before and again immediately following the treatment condition. The STAI was done first, followed by EMG on the frontalis muscle and then skin temperature measured by a hand held temperature probe. All 3 dependent variables were administered again immediately post treatment. 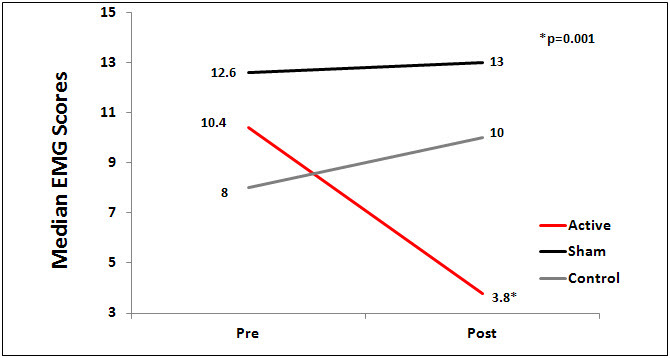 Baseline measures were taken prior to the one 20 minute CES treatment and at the completion of group therapy for both the active and sham groups. No change was made in the medical management of the patients during the single session study. The sham device was identical in appearance to the active CES unit, but did not conduct an electrical current. The active CES device was set to 300 µA. A “double-blinding” box was used to conceal the CES device from view of the subjects and research team. Investigators, subjects, research staff and statistician were all masked to the identity of the devices. Spielberger’s State Anxiety Inventory was used to measure anxiety. The scale has established reliability and validity (American Psychological Association, 2014; Spielberger 2010). Physiological measures, EMG, EDR and finger temperature, that are indications of decreased anxiety were also measured to validate level of anxiety (Bond et al., 1971). A total of 105 subjects completed the study consisting of an active CES group (N= 38), sham group (N=35) and control group (N=32). There were no statistically significant differences at baseline between the active CES and sham treatment groups for any of the outcome measures. Data were analyzed using the independent-samples t-test to compare the difference between the active CES and sham groups on depression and anxiety outcome scores. The median was used rather than the mean to eliminate scores that fell widely out of range and would have skewed the data interpretation. Scores on the STAI between 40 and 70 were accepted at pre-test. 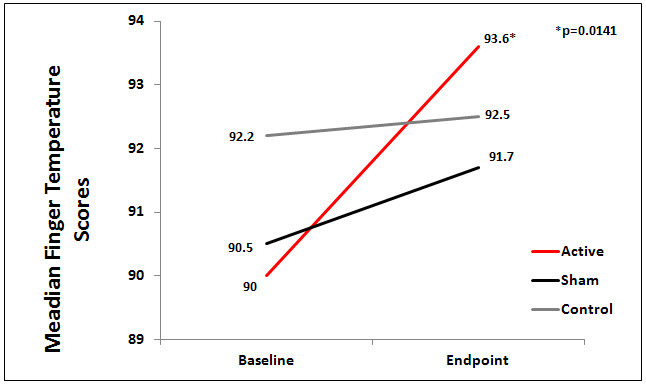 Scores between 75 and 95 were accepted on skin temperature and scores higher than 4.0 was accepted for EMG at pretest. No restrictions were placed on posttest scores. The active CES group had significantly lower anxiety scores on the State Anxiety Inventory (SAI) compared to sham group (p=.0001, d = -1.60) and control groups. The active CES group had significantly lower scores on EMG (p=.0001, d = -1.08) and increased scores on finger temperature (p=.0141. 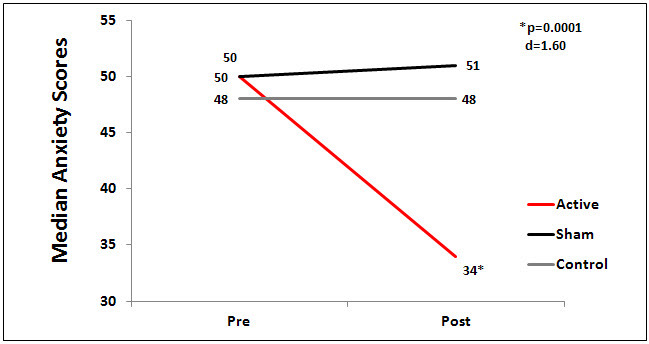 d = .50) than sham and control groups, indicating less anxiety. Figures 1, 2 and 3 show results of statistical analyses of outcome measures for the active group compared to the sham and control groups. Figure 1. Median state anxiety scores by group. Figure 2. Median EMG scores by group. Figure 3. Median Finger Temperature Scores by group. This was the first Alpha-Stim CES study that used the Alpha-Stim masked, sham controlled, randomized clinical trial research protocol. The study has served as a foundation for the development of RCTs on the effectiveness of CES for the treatment of anxiety. Strengths of the study are (1) the rigor of the research design and the use of 3 groups- active, sham and control, (2) the study was adequately powered with an N of 105, (3) diagnosis of an anxiety disorder was confirmed by a psychiatrist, (4) the research team, subjects and statistician were masked to the identity of the devices, and (5) the use of a valid subjective state anxiety scale (SAI) confirmed by objective physiological measures of anxiety. The investigator noted a limitation of the study was the method of randomization based on seating. The general outpatient psychiatric subjects tended to arrive early and select a chair resulting in more of these subjects in the active CES group than in the sham and control groups. There were fewer parolees, who usually arrived later, in the active group and more in the sham and control groups. While the chair method was used to be consistent with the usual routine in group therapy, for future studies the investigator recommended that subjects be randomly assigned by group. Clinical Director, Delos Mind/Body Institute, Corpus Christi, Texas. American Psychological Association. The State-Trait Anxiety Inventory (STAI). Accessed 4/19/2014, http://www.apa.org/pi/about/publications/caregivers/practice-settings/assessment/tools/trait-state.aspx. Bond AJ, James DC, Lader MH. Physiological and psychological measures in anxious patients. Psychological Medicine. 1974 Nov;4(4):364-73. Spielberger CD. State-Trait Anxiety Inventory. Corsini Encyclopedia of Psychology. Published Online: January 2010, http://onlinelibrary.wiley.com/book/10.1002/9780470479216.